There are so many people that love to travel and love to quilt. Here is a way to enjoy both. Sailing on beautiful ships, learning new quilting patterns from experts in the quilting world, and visiting beautiful ports of call, what more could you ask for? 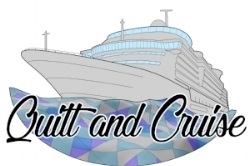 We would like to encourage quilters, non-quilters, children and friends to come along on our quilt and cruise. We are sailing on some of the most amazing ships in the world. We offer one teacher, several projects, lots of sewing time and hopefully a feeling of accomplishment when you finish the trip. There is something for everyone, even if you do not quilt.